Indira Priyadarshini Gandhi (19 November 1917  31 October 1984) was an Indian politician and central figure of the Indian National Congress party. She was the first and to date the only female Prime Minister of India. Indira Gandhi belonged to the Nehru-Gandhi political family and was the daughter of India‘s first Prime Minister, Jawaharlal Nehru. Despite her surname Gandhi, she is not related to the family of Mahatma Gandhi. She served as Prime Minister from 1966 to 1977 and then again from 1980 until her assassination in 1984, making her the second-longest-serving Prime Minister of India after her father. 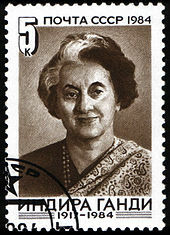 Indira Gandhi instituted state of emergency from 1975 to 1977 during which she ruled by decree. The years of emergency are recorded as the darkest years of Indian democracy where basic civil liberties were suspended and press was censored. Gandhi served as her father’s personal assistant and hostess during his tenure as prime minister between 1947 and 1964. She was elected Congress President in 1959. Upon her father’s death in 1964 she was appointed as a member of the Rajya Sabha (upper house) and became a member of Lal Bahadur Shastri‘s cabinet as Minister of Information and Broadcasting. In the Congress Party’s parliamentary leadership election held in early 1966, upon the death of Shastri, she defeated her rival, Morarji Desai, to become leader, and thus succeeded Shastri as Prime Minister of India. As the Prime Minister of India, Gandhi was known for her political ruthlessness and unprecedented centralisation of power. She went to war with Pakistan in support of the independence movement and war of independence in East Pakistan, which resulted in an Indian victory and the creation of Bangladesh, as well as increasing India’s influence to the point where it became the regional hegemon of South Asia. She was assassinated by Sikh nationalists in 1984. In her case, her elimination by her bodyguards was claimed to be a retaliation for the storming of the Harmandir Sahib (Golden Temple) in Amritsar that she ordered to counter the Punjab insurgency, less than a month before her 67th birthday. The assassins, Beant Singh and Satwant Singh, were both shot by other security guards. Satwant Singh recovered from his injuries and was executed after being found guilty of murder. In 1999, Indira was named “Woman of the Millennium” in a poll organised by the BBC. Indira Gandhi was born as Indira Priyadarshini Nehru in a Kashmiri Pandit family on 19 November 1917 in Allahabad. 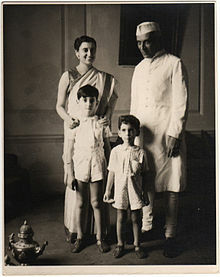 Her father, Jawaharlal Nehru, was a leading figure in India’s political struggle for independence from British rule, and became the first Prime Minister of the Dominion (and later Republic) of India. She was the only child (a younger brother was born, but died young), and grew up with her mother, Kamala Nehru, at the Anand Bhavan; a large family estate in Allahabad. She had a lonely and unhappy childhood. Her father was often away, directing political activities or incarcerated, while her mother was frequently bed-ridden with illness, and later suffered an early death from tuberculosis. She had limited contact with her father, mostly through letters. Indira was mostly taught at home by tutors, and intermittently attended school until matriculation in 1934. She was a student at the Modern School in Delhi, St Cecilia’s and St Mary’s Christian convent schools in Allahabad, the International School of Geneva, the Ecole Nouvelle in Bex, and the Pupils’ Own School in Poona and Bombay, which is affiliated to University of Mumbai. She and her mother Kamala Nehru moved to Belur Math headquarters of Ramakrishna Mission where Swami Ranganathananda was her guardian later she went on to study at the Visva-Bharati University in Santiniketan. It was during her interview that Rabindranath Tagore named her Priyadarshini, and she came to be known as Indira Priyadarshini Nehru. A year later, however, she had to leave university to attend to her ailing mother in Europe. While there, it was decided that Indira would continue her education at the University of Oxford. After her mother died, she briefly attended the Badminton School before enrolling at Somerville College in 1937 to study history. Indira had to take the entrance examination twice, having failed at her first attempt with a poor performance in Latin. At Oxford, she did well in history, political science and economics, but her grades in Latina compulsory subjectremained poor. She did, however, have an active part within the student life of the university, such as the Oxford Majlis Asian Society. During her time in Europe, Indira was plagued with ill-health and was constantly attended by doctors. She had to make repeated trips to Switzerland to recover, disrupting her studies. She was being treated there in 1940, when the Nazi armies rapidly conquered Europe. Gandhi tried to return to England through Portugal but was left stranded for nearly two months. She managed to enter England in early 1941, and from there returned to India without completing her studies at Oxford. The university later awarded her an honorary degree. In 2010, Oxford further honoured her by selecting her as one of the ten Oxasians, illustrious Asian graduates from the University of Oxford. During her stay in Great Britain, Indira frequently met her future husband Feroze Gandhi (no relation to Mahatma Gandhi), whom she knew from Allahabad, and who was studying at the London School of Economics. The marriage took place in Allahabad according to Adi Dharm rituals though Feroze belonged to a Zoroastrian Parsi family of Gujarat. The couple had two sons, Rajiv Gandhi (born 1944) and Sanjay Gandhi (born 1946). a woman would be an ideal tool for the Syndicate. Indira formed her government with Morarji Desai as Deputy Prime Minister and Finance Minister. At the beginning of her first term as prime minister, Indira was widely criticized by the media and the opposition as a “Goongi goodiya” (Hindi word for a dumb doll or puppet) of the Congress party bosses who had got her elected and tried to constrain her. The first electoral test for Indira was the 1967 general elections for the Lok sabha and state assemblies. The Congress Party won a reduced majority for the Lok sabha in these elections owing to widespread disenchantment over rising prices of commodities, unemployment, economic stagnation and a food crisis. Indira Gandhi had started on a rocky note after agreeing to a devaluation of the rupee, which created much hardship for Indian businesses and consumers, and the import of wheat from the United States fell through due to political disputes. The party also for the first time lost power or lost majority in a number of states across the country. Following the 1967 elections, Indira Gandhi gradually started moving towards socialist policies. In 1969, she fell out with senior Congress party leaders on a number of issues. Chief among them was the decision by Indira to support V. V. Giri, the independent candidate rather than the official Congress party candidate Neelam Sanjiva Reddy for the vacant position of President of India. The other was the announcement by the prime minister of Bank nationalization without consulting the finance minister, Morarji Desai. These steps culminated in Party president S. Nijalingappa expelling her from the party for indiscipline. Gandhi, in turn floated her own faction of the Congress party and managed to retain most of the Congress MPs on her side with only 65 on the side of Congress (O) faction. The Indira faction, called Congress (R), lost its majority in the parliament but remained in power with the support of regional parties such as DMK. The policies of the Congress under Indira Gandhi, prior to the 1971 elections, also included proposals for the abolition of Privy Purse to former rulers of the Princely states and the 1969 nationalization of the fourteen largest banks in India. The biggest achievement of Indira Gandhi after the 1971 election came in December 1971 with India’s decisive victory over Pakistan in the liberation war, that led to the formation of independent Bangladesh. She was hailed as Goddess Durga by opposition leader Atal Bihari Vajpayee at that time. In the elections held for State assemblies across India in March 1972, the Congress (R) swept to power in most states riding on the post-war “Indira wave”. Despite the victory against Pakistan, the Congress government faced numerous problems during this term. Some of these were due to high inflation which was in turn caused by war time expenses, drought in some parts of the country and more importantly, the 1973 oil crisis. The opposition to Gandhi in 197375 period, after the Indira wave had receded, was strongest in the states of Bihar and Gujarat. In Bihar, Jayaprakash Narayan, the veteran leader came out of retirement to lead the protest movement there. On 12 June 1975, the Allahabad High Court declared Indira Gandhi’s election to the Lok Sabha in 1971 void on grounds of electoral malpractice. In an election petition filed by her 1971 opponent, Raj Narain (who later on defeated her in 1977 parliamentary election from Raebareli), alleged several major as well as minor instances of using government resources for campaigning. The court ordered her stripped of her parliamentary seat and banned from running for any office for six years. According to constitution, the Prime Minister must be a member of either the Lok Sabha (the lower house in the Parliament of India) or a member of the Rajya Sabha (the upper house). Thus, this decision effectively removed her from office. Gandhi had asked one of her colleagues in government, Mr. Ashoke Kumar Sen to defend her in court. But Gandhi rejected calls to resign and announced plans to appeal to the Supreme Court. The verdict was delivered by Mr Justice Jagmohanlal Sinha at Allahabad High Court. It came almost four years after the case was brought by Raj Narain, the premier’s defeated opponent in the 1971 parliamentary election. Gandhi, who gave evidence in her defence during the trial, was found guilty of dishonest election practices, excessive election expenditure, and of using government machinery and officials for party purposes. The judge, however, rejected more serious charges of bribery against her. Gandhi insisted that the conviction did not undermine her position, despite having been unseated from the lower house of parliament, Lok Sabha, by order of the High Court. She said: “There is a lot of talk about our government not being clean, but from our experience the situation was very much worse when parties were forming governments”. And she dismissed criticism of the way her Congress Party raised election campaign money, saying all parties used the same methods. The prime minister retained the support of her party, which issued a statement backing her. After news of the verdict spread, hundreds of supporters demonstrated outside her house, pledging their loyalty. Indian High Commissioner BK Nehru said Gandhi’s conviction would not harm her political career. “Mrs Gandhi has still today overwhelming support in the country,” he said. “I believe the prime minister of India will continue in office until the electorate of India decides otherwise”. Gandhi moved to restore order by ordering the arrest of most of the opposition participating in the unrest. Her Cabinet and government then recommended that President Fakhruddin Ali Ahmed declare a state of emergency because of the disorder and lawlessness following the Allahabad High Court decision. Accordingly, Ahmed declared a State of Emergency caused by internal disorder, based on the provisions of Article 352(1) of the Constitution, on 25 June 1975. Within a few months, President’s rule was imposed on the two opposition party ruled states of Gujarat and Tamil Nadu thereby bringing the entire country under direct Central rule or by governments led by the ruling Congress party. Police were granted powers to impose curfews and indefinitely detain citizens and all publications were subjected to substantial censorship by the Ministry of Information and Broadcasting. Finally, the impending legislative assembly elections were indefinitely postponed, with all opposition-controlled state governments being removed by virtue of the constitutional provision allowing for a dismissal of a state government on recommendation of the state’s governor. Indira Gandhi used the emergency provisions to change conflicting party members. President Ahmed issued ordinances that did not require debate in the Parliament, allowing Gandhi to rule by decree. It was said that during the Emergency he virtually ran India along with his friends, especially Bansi Lal. It was also quipped that Sanjay Gandhi had total control over his mother and that the government was run by the PMH (Prime Minister House) rather than the PMO (Prime Minister Office). In 1977, after extending the state of emergency twice, Indira Gandhi called elections to give the electorate a chance to vindicate her rule. Gandhi may have grossly misjudged her popularity by reading what the heavily censored press wrote about her. In any case, she was opposed by the Janata alliance of Opposition parties. The alliance was made up of right-wing Hindu leaning Bharatiya Jana Sangh, Congress (O), The Socialist parties, and Charan Singh‘s Bharatiya Kranti Dal representing northern peasant and farmers. Janata alliance, with Jai Prakash Narayan as its spiritual guide, claimed the elections were the last chance for India to choose between “democracy and dictatorship.” The Congress Party split during the election campaign of 1977: veteran Indira supporters like Jagjivan Ram, Hemvati Nandan Bahuguna and Nandini Satpathy were compelled to part ways and form a new political entity, CFD (Congress for Democracy), primarily due to intra-party politicking and also due to circumstances created by Sanjay Gandhi. The prevailing rumour was that Sanjay had intentions of dislodging Gandhi and the trio stood between that. Gandhi’s Congress party was crushed soundly in the elections. The public realized the statement and motto of the Janata Party alliance. Indira and Sanjay Gandhi both lost their seats, and Congress was cut down to 153 seats (compared with 350 in the previous Lok Sabha), 92 of which were in the South. The Janata alliance, under the leadership of Morarji Desai, came into power after the State of Emergency was lifted. The alliance parties later merged to form the Janata Party under the guidance of Gandhian leader, Jayaprakash Narayan. The other leaders of the Janata Party were Charan Singh, Raj Narain, George Fernandes and Atal Bihari Vajpayee. Since Gandhi had lost her seat in the election, the defeated Congress party appointed Yashwantrao Chavan as their parliamentary party leader. Soon afterwards, the Congress party split again with Gandhi floating her own Congress faction. She won a by-election from the Chikmagalur Constituency to the Lok Sabha in November 1978. However, the Janata government’s Home Minister, Choudhary Charan Singh, ordered the arrest of her and Sanjay Gandhi on several charges, none of which would be easy to prove in an Indian court. The arrest meant that Indira Gandhi was automatically expelled from Parliament. These allegations included that she “had planned or thought of killing all opposition leaders in jail during the Emergency”. In response to her arrest, Indira Gandhi’s supporters hijacked an Indian Airlines jet and demanded her immediate release. However, this strategy backfired disastrously. Her arrest and long-running trial gained her great sympathy from many people. The Janata coalition was only united by its hatred of Gandhi (or “that woman” as some called her). The party included right wing Hindu Nationalists, Socialists and former Congress party members. With so little in common, the Morarji Desai government was bogged down by infighting. In 1979, the government started to unravel over the issue of dual loyalties of some members to Janata and the RSS. The ambitious Union Finance minister, Charan Singh, who as the Union Home Minister during the previous year had ordered arrest of Gandhi, took advantage of this and started courting the Congress. After a significant exodus from the party to Charan Singh’s faction, Desai resigned in July 1979. Charan Singh was appointed Prime Minister, by President Reddy, after Indira and Sanjay Gandhi promised Singh that Congress would support his government from outside on certain conditions. The conditions included dropping all charges against Indira and Sanjay. Since Charan Singh refused to drop the charges, Congress withdrew its support and President Reddy dissolved Parliament in August 1979. Before the 1980 elections Gandhi approached the then Shahi Imam of Jama Masjid, Syed Abdullah Bukhari and entered into an agreement with him on the basis of 10-point programme to secure the support of the Muslim votes. In the elections held in January, Congress returned to power with a landslide majority. In 1979, when she visited Madurai, some hooligans attacked her. Nedumaran saved her from the attacks. The Congress under Gandhi swept back to power in January 1980. Elections soon after to State assemblies across the country also brought back Congress ministries in the state with Indira’s son Sanjay Gandhi choosing loyalists to lead the states. Unfortunately, Indira experienced an immense personal loss when Sanjay Gandhi died an air crash while performing an aerobatic manoeuvre on 23 June 1980 in New Delhi. Gandhi by this stage only trusted her family members and therefore decided to bring in her reluctant pilot son, Rajiv into politics. In the 1977 elections, a coalition led by the Sikh-majority Akali Dal came to power in the northern Indian state of Punjab. In an effort to split the Akali Dal and gain popular support among the Sikhs, Indira Gandhi’s Congress helped bring the orthodox religious leader Jarnail Singh Bhindranwale to prominence in Punjab politics. Later, Bhindranwale’s organisation Damdami Taksal became embroiled in violence with another religious sect called the Sant Nirankari Mission, and he was accused of instigating the murder of the Congress leader Jagat Narain. After being arrested in this matter, Bhindranwale disassociated himself from Congress and joined hands with the Akali Dal. In July 1982, he led the campaign for the implementation of the Anandpur Resolution, which demanded greater autonomy for the Sikh-majority state. Meanwhile, a small section of the Sikhs, including some of Bhindranwale’s followers, turned to militancy after being targeted by government officials and police in support of the Resolution. In 1982, Bhindranwale and approximately 200 armed followers moved into a guest-house called the Guru Nanak Niwas, in the precinct of the Golden Temple . By 1983, Harmandir Sahib became a fort for a large number of militants. On 23 April 1983, the Punjab Police Deputy Inspector General A. S. Atwal was shot dead as he left the Golden Temple compound. The following day, after the murder, Harchand Singh Longowal (then president of Shiromani Akali Dal) confirmed the involvement of Bhindranwale in the murder.Harmandir Sahib compound and some of the surrounding houses were fortified. The Statesman reported on 4 July that light machine guns and semi-automatic rifles were known to have been brought into the compound. I am alive today, I may not be there tomorrow…I shall continue to serve until my last breath and when I die, I can say, that every drop of my blood will invigorate India and strengthen it. After her death, the Parade Ground was converted to the Indira Gandhi Park which was inaugurated by her son, Rajiv Gandhi. On 31 October 1984, two of Gandhi’s bodyguards, Satwant Singh and Beant Singh, shot her with their service weapons in the garden of the Prime Minister’s residence at 1 Safdarjung Road, New Delhi. The shooting occurred as she was walking past a wicket gate guarded by Satwant and Beant. She was to have been interviewed by the British actor Peter Ustinov, who was filming a documentary for Irish television. Beant Singh shot her three times using his side-arm and Satwant Singh fired 30 rounds. Beant Singh and Satwant Singh dropped their weapons and surrendered. Afterwards they were taken away by other guards into a closed room where Beant Singh was shot dead. Kehar Singh was later arrested for conspiracy in the attack. Both Satwant and Kehar were sentenced to death and hanged in Delhi’s Tihar Jail. Indira Gandhi was brought at 9:30 AM to the All India Institutes of Medical Sciences where doctors operated on her. She was declared dead at 2:20 PM. The post-mortem examination was conducted by a team of doctors headed by Dr. Tirath Das Dogra. Dr Dogra stated that as many as 30 bullet wounds were sustained by Indira Gandhi, from two sources, a Sten gun and a pistol. The assailants had fired 31 bullets at her, of which 30 had hit; 23 had passed through her body while 7 were trapped inside her. Dr Dogra extracted bullets to establish the identity of the weapons and to match each weapon with the bullets recovered by ballistic examination. The bullets were matched with respective weapons at CFSL Delhi. Subsequently, Dr Dogra appeared in the court of Shri Mahesh Chandra as an expert witness (PW-5), and his testimony lasted several sessions. The cross examination was conducted by Shri Pran Nath Lekhi, the defence counsel.Salma Sultan gave the first news of the assassination of Indira Gandhi on Doordarshan‘s evening news on 31 October 1984, more than 10 hours after she was shot. She died two weeks and five days before her 67th birthday. Gandhi was cremated on 3 November near Raj Ghat. The site where she was cremated is today known as Shakti Sthal. Indira Gandhi is remembered for her ability to effectively promote Indian foreign policy measures. In early 1971, disputed elections in Pakistan led the then East Pakistan to declare independence as Bangladesh. Repression and violence by the Pakistani army led 10 million refugees to cross border in to India over the coming months. Finally in December 1971, Gandhi directly intervened in the conflict to liberate Bangladesh. India emerged victorious in the resulting conflict to become the dominant power of South Asia. India had signed a treaty with the Soviet Union promising mutual assistance in the case of war, while Pakistan received active support from the United States during the conflict. U.S. President Richard Nixon disliked Gandhi personally, referring to her as a “witch” and “clever fox” in his private communication with Secretary of State Henry Kissinger. Nixon later wrote of the war: ” suckered . Suckered us…..this woman suckered us.”. Relations with the U.S. became distant as Gandhi developed closer ties with the Soviet Union after the war. The latter grew to become India’s largest trading partner and its biggest arms supplier for much of Gandhi’s premiership. India’s new hegemonic position as articulated under the “Indira Doctrine” led to attempts to bring the Himalayan states under the Indian sphere of influence.Nepal and Bhutan remained aligned with India, while in 1975, after years of building up support, Gandhi incorporated Sikkim into India, after a referendum in which a majority of Sikkimese voted to join India. This was denounced as a “despicable act” by China. India maintained close ties with neighbouring Bangladesh (formerly East Pakistan) following the Liberation War. Prime Minister Sheikh Mujibur Rahman recognized Gandhi’s contributions to the independence of Bangladesh. However, Mujibur Rahman’s pro-India policies antagonised many in Bangladeshi politics and the military, who feared that Bangladesh had become a client state of India. The Assassination of Mujibur Rahman in 1975 led to the establishment of Islamist military regimes that sought to distance the country from India. Gandhi’s relationship with the military regimes was strained, due to her alleged support of anti-Islamist leftist guerrilla forces in Bangladesh. Generally, however, there was a rapprochement between Gandhi and the Bangladeshi regimes, although issues such as border disputes and the Farakka Dam remained an irritant in bilateral ties. In 2011, the Government of Bangladesh conferred its highest state award posthumously on Gandhi for her “outstanding contribution” to the country’s independence. India’s relationship with Pakistan remained strained following the Shimla Accord in 1972. Gandhi’s authorization of the detonation of a nuclear device at Pokhran in 1974 was viewed by Pakistani leader Zulfikar Ali Bhutto as an attempt to intimidate Pakistan into accepting India’s hegemony in the subcontinent. However, in May 1976, Gandhi and Bhutto both agreed to reopen diplomatic establishments and normalize relations. Following the rise to power of General Muhammad Zia-ul-Haq in Pakistan in 1978, India’s relations with its neighbour reached a nadir. Gandhi accused General Zia of supporting Khalistani militants in Punjab. Military hostilities recommenced in 1984 following Gandhi’s authorization of Operation Meghdoot. India was victorious in the resulting Siachen conflict against Pakistan. Gandhi remained a staunch supporter of Palestinians in the ArabIsraeli conflict and was critical of the Middle East diplomacy sponsored by the United States.Israel was viewed as a religious state and thus an analogue to India’s archrival Pakistan. Indian diplomats also hoped to win Arab support in countering Pakistan in Kashmir. Nevertheless, Gandhi authorized the development of a secret channel of contact and security assistance with Israel in the late 1960s. Her lieutenant, P. V. Narasimha Rao, later became Prime Minister and approved full diplomatic ties with Israel in 1992. India’s pro-Arab policy had mixed success. Establishment of close ties with the socialist and secular Baathist regimes to some extent neutralized Pakistani propaganda against India. However, the Indo-Pakistani War of 1971 put the Arab and Muslim states of the Middle East in a dilemma as the war was fought by two states both friendly to the Arabs. The progressive Arab regimes in Egypt, Syria, and Algeria chose to remain neutral, while the conservative pro-American Arab monarchies in Jordan, Saudi Arabia, Kuwait, and United Arab Emirates openly supported Pakistan. Egypt’s stance was met with dismay by the Indians, who had come to expect close co-operation with the Baathist regimes. 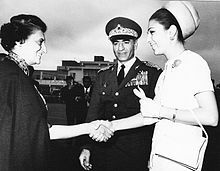 But, the death of Nasser in 1970 and Sadat‘s growing friendship with Riyadh, and his mounting differences with Moscow, constrained Egypt to a policy of neutrality. Gandhi’s overtures to Muammar Gaddafi were rebuffed.Libya agreed with the Arab monarchies in believing that Gandhi’s intervention in East Pakistan was an attack against Islam. The 1971 war temporarily became a stumbling block in growing Indo-Iranian ties. Although Iran had earlier characterized the Indo-Pakistani war in 1965 as Indian aggression, the Shah had launched an effort at rapprochement with India in 1969 as part of his effort to secure support for a larger Iranian role in the Persian Gulf. Gandhi’s tilt towards Moscow and her dismemberment of Pakistan was perceived by the Shah as part of a larger anti-Iran conspiracy involving India, Iraq, and the Soviet Union. Nevertheless, Iran had resisted Pakistani pressure to activate the Baghdad Pact and draw in the Central Treaty Organisation (CENTO) into the conflict. Gradually, Indian and Iranian disillusionment with their respective regional allies led to a renewed partnership between the nations. Gandhi was unhappy with the lack of support from India’s Arab allies during the war with Pakistan, while the Shah was apprehensive at the growing friendship between Pakistan and Arab states of the Persian Gulf, specially Saudi Arabia, and the growing influence of Islam in Pakistani society. There was an increase in Indian economic and military co-operation with Iran during the 1970s. The 1974 India-Iranian agreement led to Iran supplying nearly 75 percent of India’s crude oil demands. Gandhi appreciated the Shah’s disregard of Pan-Islamism in diplomacy. One of the major developments in Southeast Asia during Gandhi’s premiership was the formation of the Association of Southeast Asian Nations (ASEAN) in 1967. Relations between ASEAN and India was mutually antagonistic. ASEAN in the Indian perception was linked to the Southeast Asia Treaty Organization (SEATO), and it was therefore, seen as a pro-American organisation. On their part, the ASEAN nations were unhappy with Gandhi’s sympathy for the Viet Cong and India’s strong links with the USSR. Furthermore, they were also apprehensions in the region about Gandhi’s future plans, particularly after India played a big role in breaking up Pakistan and facilitating in the emergence of Bangladesh as a sovereign country in 1971. India’s entry into the nuclear weapons club in 1974 contributed to tensions in Southeast Asia. Relations only began to improve following Gandhi’s endorsement of the ZOPFAN declaration and the disintegration of the SEATO alliance in the aftermath of Pakistani and American defeats in the region. Nevertheless, Gandhi’s close relations with reunified Vietnam and her decision to recognize the Vietnam installed Government of Cambodia in 1980 meant that India and ASEAN were not able to develop a viable partnership. Although independent India was initially viewed as a champion of anti-colonialism, its cordial relationship with the Commonwealth of Nations and liberal views of British colonial policies in East Africa had harmed its image as a staunch supporter of the anti-colonial movements. Indian condemnation of militant struggles in Kenya and Algeria was in sharp contrast to China, who had supported armed struggle to win African independence. After reaching a high diplomatic point in the aftermath of Nehru’s role in the Suez Crisis, India’s isolation from Africa was complete when only four nations; Ethiopia, Kenya, Nigeria and Libya supported her during the Sino-Indian War in 1962. After Gandhi became Prime Minister, diplomatic and economic relations with the states which had sided with India during the Sino-Indian War were expanded. Gandhi began negotiations with the Kenyan government to establish the Africa-India Development Cooperation. The Indian government also started considering the possibility of bringing Indians settled in Africa within the framework of its policy goals to help recover its declining geo-strategic influence. Gandhi declared the people of Indian origin settled in Africa as “Ambassors of India.” Efforts to rope in the Asian community to join Indian diplomacy, however, came to naught, partly because of the unwillingness of Indians to remain in politically insecure surroundings and partly due to the exodus of African Indians to Britain with the passing of the Commonwealth Immigrants Act in 1968. In Uganda, the African Indian community even suffered persecution and eventually expulsion under the government of Idi Amin. Foreign and domestic policy successes in the 1970s enabled Gandhi to rebuild India’s image in the eyes of African states. Victory over Pakistan and India’s possession of nuclear weapons showed the degree of India’s progress. Furthermore, the conclusion of the Indo-Soviet treaty in 1971 and threatening gestures by the major western power, the United States, to send its nuclear armed Task Force 74 into the Bay of Bengal at the height of the East Pakistan crisis had enabled India to regain its anti-imperialist image. Gandhi firmly tied Indian anti-imperialist interests in Africa to those of the Soviet Union. Unlike Nehru, she openly and enthusiastically supported liberation struggles in Africa. At the same time, Chinese influence in Africa had declined owing to its incessant quarrels with the Soviet Union. These developments permanently halted India’s decline in Africa and helped reestablish its geo-strategic presence. Indira spent a number of years in Europe during her youth and formed many friendships during her stay there. During her premiership she formed friendship with many socialist leaders such as German chancellor, Willy Brandt and Austrian chancellor Bruno Kreisky. She also enjoyed closed working relationship with many British leaders including conservative premiers, Edward Heath and Margaret Thatcher. When Indira came to power in 1966, Lyndon Johnson was the US President. At that time, India was reliant on USA for food aid. Indira resented the US policy of food aid as a tool in forcing India to adopt policies favored by the US. She also resolutely refused to sign the NPT (Treaty on the Non-Proliferation of Nuclear Weapons). Relations with US strained badly under President Richard Nixon and his favoring of Pakistan during the Bangladesh liberation war. Nixon despised Indira politically and personally. Indira met President Ronald Reagan in 1981 for the first time at the NorthSouth Summit held to discuss global poverty. Indira had been described to him as an ‘Ogre’ but he found her charming and easy to work with and they formed a close working relationship during her premiership in 1980s. Gandhi presided over three Five-Year plans as Prime Minister, two of which succeeded in meeting the targeted growth. Gandhi inherited a weak and troubled economy. Fiscal problems associated with the war with Pakistan in 1965, along with a drought-induced food crisis that spawned famines, had plunged India into the sharpest recession since independence. The government responded by taking steps to liberalize the economy, and by agreeing to the devaluation of the currency in return for the restoration of foreign aid. The economy managed to recover in 1966 and ended up growing at 4.1% over 19661969. But, much of that growth was offset by the fact that the external aid promised by the United States government and the International Bank for Reconstruction and Development (IBRD), meant to ease the short-run costs of adjustment to a liberalized economy, never materialized. American policy makers had complained of continued restrictions imposed on the economy. At the same time, Indo-US relations were straining due to Gandhi’s criticism of the American bombing campaign in Vietnam. While it was thought, at the time, and for decades after, that President Johnson‘s policy of withholding food grain shipments was to coerce Indian support for the war, in fact, it was to offer India rainmaking technology that he wanted to use as a counterweight to China’s possession of the atomic bomb. In light of the circumstances, liberalization became politically suspect and was soon abandoned. Grain diplomacy and currency devaluation became matters of intense national pride in India. After the bitter experience with Johnson, Gandhi decided not to request food aid in the future. Moreover, Gandhi’s government resolved never again to become “so vulnerably dependent” on aid, and painstakingly began building up substantial foreign exchange reserves. When food stocks slumped after poor harvests in 1972, the government made it a point to use foreign exchange to buy US wheat commercially rather than seek resumption of food aid. To deal with India’s food problems, Gandhi expanded the emphasis on production of inputs to agriculture that had already been initiated by her father, Jawaharlal Nehru. The Green Revolution in India subsequently culminated under her government in the 1970s and transformed the country from a nation heavily reliant on imported grains and prone to famine to being largely able to feed itself, and become successful in achieving its goal of food security. Gandhi had a personal motive in pursuing agricultural self-sufficiency, having found India’s dependency on the U.S. for shipments of grains humiliating. The economic period of 196775 became significant for its major wave of nationalisations amidst the increased regulation of the private sector. Some of the other objectives of the economic plan for the period was to provide for the minimum needs of the community through a rural works program and the removal of the privy purses of the nobility. Both these, and many other goals of the 1967 program were accomplished by 197475. Nevertheless, the success of the overall economic plan was tempered by the fact that annual growth at 3.33.4% over 196974 fell short of the targeted figure. The Fifth Five Year Plan (197479) was enacted in the backdrop of the state of emergency and the Twenty Point Program of 1975. The latter was the economic rationale of the emergency, a political act which has often been justified on economic grounds. In contrast to the reception of Gandhi’s earlier economic plan, this one was criticized for being a “hastily thrown together wish list.” Gandhi promised to reduce poverty by targeting the consumption levels of the poor and enact wide-ranging social and economic reforms. The government additionally targeted an annual growth of 4.4% over the period of the plan. The measures of the emergency regime was able to halt the economic trouble of the early to mid-1970s, which had been marred by harvest failures, fiscal contraction, and the breakdown of the Bretton Woods system of fixed exchanged rate; the resulting turbulence in the foreign exchange markets being further accentuated by the oil shock of 1973. The government was even able to exceed the targeted growth figure with an annual growth rate of 5.05.2% over the five-year period of the plan (197479). The economy grew at the rate of 9% in 197576 alone, and the Fifth Plan, became the first plan during which the per capita income of the economy grew by over 5%. Gandhi inherited a weak economy when she again became Prime Minister in 1980. The preceding year in 197980 under the Janata Party government had led to the strongest recession (?5.2%) in the history of modern India with inflation rampant at 18.2%. Gandhi proceeded to abrogate the Janata Party government’s Five Year Plan in 1980 and launched the Sixth Five Year Plan (198085). The government targeted an average growth of 5.2% over the period of the plan. Measures to check the inflation were also taken; by the early 1980s inflation was under control at an annual rate of about 5%. Although Gandhi continued professing socialist beliefs, the Sixth Five Year Plan was markedly different from the years of Garibi Hatao. Populist programs and policies were replaced by pragmatism. There was an emphasis on tightening public expenditures, greater efficiency of the state-owned enterprises (SOE), which Gandhi qualified as a “sad thing”, and in stimulating the private sector through deregulation and liberation of the capital market. The government subsequently launched Operation Forward in 1982, the first cautious attempt at reform. The Sixth Plan went on to become the most successful of the Five Year plans yet; showing an average growth of 5.7% over 198085. During Lal Bahadur Shastri’s last full year in office (1965), inflation averaged 7.7%, compared to 5.2% at the end of Gandhi’s first stint in office (1977). On average, inflation in India had remained below 7% through the 1950s and 1960s. But, it then accelerated sharply in the 1970s, from 5.5% in 197071 to over 20% by 197374, due to the international oil crisis. Gandhi declared inflation the gravest of problems in 1974 (at 25.2%) and devised a severe anti-inflation program. The government was successful in bringing down inflation during the emergency; achieving negative figures of ?1.1% by the end of 197576. Gandhi inherited a tattered economy in her second term; harvest failures and a second oil shock in the late 1970s had again caused inflation to rise. During Charan Singh‘s short reign in office in the second half of 1979, inflation averaged 18.2%, compared to 6.5% during Gandhi’s last year in office (1984). General economic recovery under Gandhi led to an average inflation at 6.5% from 198182 to 198586; the lowest since the beginning of India’s inflation problems in the 1960s. Unemployment stayed constant at 9% over a nine-year period (197180) before declining to 8.3% in 1983. Despite the provisions, control and regulations of Reserve Bank of India, most banks in India had continued to be owned and operated by private persons. Businessmen who owned the banks were often accused of channeling the deposits into their own companies, and ignoring the priority sector. Furthermore, there was a great resentment against class banking in India, which had left the poor (the majority population) unbanked. After becoming Prime Minister, Gandhi expressed the intention of nationalising the banks in a paper titled, “Stray thoughts on Bank Nationalisation” in order to alleviate poverty. The paper received the overwhelming support of the public. In 1969, Gandhi moved to nationalise fourteen major commercial banks. After the nationalisation of banks, the branches of the public sector banks in India rose to approximate 800 percent in deposits, and advances took a huge jump by 11,000 percent. Nationalisation also resulted in a significant growth in the geographical coverage of banks; the number of bank branches rose from 8,200 to over 62,000, most of which were opened in the unbanked, rural areas. The nationalization drive not only helped to increase household savings, but it also provided considerable investments in the informal sector, in small and medium-sized enterprises, and in agriculture, and contributed significantly to regional development and to the expansion of India’s industrial and agricultural base.Jayaprakash Narayan, who became famous for leading the opposition to Gandhi in the 1970s, was solid in his praise for her bank nationalisations. Having been re-elected in 1971 on a nationalisation platform, Gandhi proceeded to nationalise the coal, steel, copper, refining, cotton textiles, and insurance industries. Most of these nationalisations were made to protect employment and the interest of the organised labour. The remaining private sector industries were placed under strict regulatory control. During the Indo-Pakistani War of 1971, foreign-owned private oil companies had refused to supply fuel to the Indian Navy and Indian Air Force. In response, Gandhi nationalised oil companies in 1973. After nationalisation the oil majors such as the Indian Oil Corporation (IOC), the Hindustan Petroleum Corporation (HPCL) and the Bharat Petroleum Corporation (BPCL) had to keep a minimum stock level of oil, to be supplied to the military when needed. In 1966, Gandhi accepted the demands of the Akali’s to reorganize Punjab on linguistic lines. The Hindi-speaking southern half of Punjab became a separate state, Haryana, while the Pahari speaking hilly areas in the north east were joined to Himachal Pradesh. In doing so, she had hoped to ward off the growing political conflict between Hindu and Sikh groups in the region. However, a contentious issue that was considered unresolved by the Akali’s was the status of Chandigarh, a prosperous city on the Punjab-Haryana border, which Gandhi declared a union territory to be shared as a capital by both the states. Victory over Pakistan in 1971 consolidated Indian power in Kashmir. Gandhi indicated that she would make no major concessions on Kashmir. The most prominent of the Kashmiri separatists, Sheikh Abdullah, had to recognize India’s control over Kashmir in light of the new order in South Asia. The situation was normalized in the years following the war after Abdullah agreed to an accord with Gandhi, by giving up the demand for a plebiscite in return for a special autonomous status for Kashmir. In 1975, Gandhi declared the state of Jammu and Kashmir as a constituent unit of India. The Kashmir conflict remained largely peaceful if frozen under Gandhi’s premiership. In 1972, Gandhi granted statehood to Meghalaya, Manipur and Tripura, while the North-East Frontier Agency was declared a union territory and renamed Arunachal Pradesh. The transition to statehood for these territories was successfully overseen by her administration. This was followed by the annexation of Sikkim in 1975. The principle of equal pay for equal work for both men and women was enshrined in the Indian Constitution under the Gandhi administration. Gandhi questioned the continued existence of a privy purse for former rulers of princely states. She argued the case for abolition based on equal rights for all citizens and the need to reduce the government’s revenue deficit. The nobility responded by rallying around the Jana Sangh and other right-wing parties that stood in opposition to Gandhi’s attempts to abolish royal privileges. The motion to abolish privy purses, and the official recognition of the titles, was originally brought before the Parliament in 1970. It was passed in the Lok Sabha but felt short of the two-thirds majority in the Rajya Sabha by a single vote. Gandhi responded by having a Presidential proclamation issued; de-recognizing the princes; with this withdrawal of recognition, their claims to privy purses were also legally lost. However, the proclamation was struck down by the Supreme Court of India. In 1971, Gandhi again motioned to abolish the privy purse. This time, it was successfully passed as the 26th Amendment to the Constitution of India. Many royals tried to protest the abolition of the privy purse, primarily through campaigns to contest seats in elections. They, however, received a final setback when many of them were defeated by huge margins. Gandhi claimed that only “clear vision, iron will and the strictest discipline” can remove poverty. She justified the imposition of the state of emergency in 1975 in the name of the socialist mission of the Congress. Armed with the power to rule by decree and without constitutional constraints, Gandhi embarked on a massive redistribution program. The provisions included rapid enforcement of land ceilings, housing for landless labourers, the abolition of bonded labour and a moratorium on the debts of the poor. North India was at the centre of the reforms; millions of acres of land were acquired and redistributed. The government was also successful in procuring houses for landless labourers; according to Frankel, three-fourths of the targeted four million houses was achieved in 1975 alone. Nevertheless, others have disputed the success of the program and criticized Gandhi for not doing enough to reform land ownership. The political economist, Jyotindra Das Gupta, cryptically questioned “…whether or not the real supporters of land-holders were in jail or in power?” Critics also accused Gandhi of choosing to “talk left and act right”, referring to her concurrent pro-business decisions and endeavours.Rosser wrote that “some have even seen the declaration of emergency rule in 1975 as a move to suppress dissent against Gandhi’s policy shift to the right.” Regardless of the controversy over the nature of the reforms, the long-term effects of the social changes gave rise to prominence of middle-ranking farmers from intermediate and lower castes in North India. The rise of these newly empowered social classes challenged the political establishment of the Hindi Belt in the years to come. Under the Constitution of India of 1950, Hindi was to have become the official national language by 1965. This was not acceptable to many non-Hindi speaking states, who wanted the continued use of English in government. In 1967, Gandhi made a constitutional amendment that guaranteed the de facto use of both Hindi and English as official languages. This established the official government policy of bilingualism in India and satisfied the non-Hindi speaking Indian states. Gandhi thus put herself forward as a leader with a pan-Indian vision. Nevertheless, critics alleged that her stance was actually meant to weaken the position of rival Congress leaders from the northern states such as Uttar Pradesh, where there had been strong, sometimes violent, pro-Hindi agitations. Gandhi came out of the language conflicts with the strong support of the south Indian populace. In the late 1960s and 1970s, Gandhi had the Indian army crush militant Communist uprisings in the Indian state of West Bengal. The communist insurgency in India was completely suppressed during the state of emergency. Gandhi considered the north-eastern regions important, because of its strategic situation. In 1966, the Mizo uprising took place against the government of India and overran almost the whole of the Mizoram region. Gandhi ordered the Indian Army to launch massive retaliatory strikes in response. The rebellion was suppressed with the Indian Air Force even carrying out airstrikes in Aizawl; this remains the only instance of India carrying out an airstrike in its own civilian territory. The defeat of Pakistan in 1971 and the secession of East Pakistan as pro-India Bangladesh led to the collapse of the Mizo separatist movement. In 1972, after the less extremist Mizo leaders came to the negotiating table, Gandhi upgraded Mizoram to the status of a union territory. A small-scale insurgency by some militants continued into the late 1970s but was successfully dealt with by the government. The Mizo conflict was definitively resolved during the administration of Gandhi’s son Rajiv. Today, Mizoram is considered as one of the most peaceful states in the north-east. Responding to the insurgency in Nagaland, Gandhi “unleashed a powerful military offensive” in the 1970s. Finally, a massive crackdown on the insurgents took place during the state of emergency ordered by Gandhi. The insurgents soon agreed to surrender and signed the Shillong Accord in 1975. While the agreement was considered a victory for the Indian government and ended large-scale conflicts, there has since been spurts of violence by rebel holdouts and ethnic conflict amongst the tribes. Gandhi contributed and further carried out the vision of Jawaharlal Nehru, former Premier of India to develop the program. Gandhi authorised the development of nuclear weapons in 1967, in response to the Test No. 6 by People’s Republic of China. Gandhi saw this test as Chinese nuclear intimidation, therefore, Gandhi promoted the views of Nehru to establish India’s stability and security interests as independent from those of the nuclear superpowers. The program became fully mature in 1974, when Dr. Raja Ramanna reported to Gandhi that India had the ability to test its first nuclear weapon. Gandhi gave verbal authorisation of this test, and preparations were made in a long-constructed army base, the Indian Army Pokhran Test Range. In 1974, India successfully conducted an underground nuclear test, unofficially code named as “Smiling Buddha“, near the desert village of Pokhran in Rajasthan. As the world was quiet by this test, a vehement protest came forward from Pakistan. Great ire was raised in Pakistan and its Prime Minister, Zulfikar Ali Bhutto, described this test as “Indian hegemony” to intimidate Pakistan. In response to this Bhutto launched a massive campaign all over the Pakistan to make Pakistan a nuclear power. In these campaigns Bhutto asked the nation to get united and great slogans were raised such as hum ghaas aur pattay kha lay gay magar nuclear power ban k rhe gay (We will eat grass or leaves even go hungry but will get nuclear power). Gandhi directed a letter to Bhutto and, later to the world, describing the test for peaceful purposes and India’s commitment to develop its programme for industrial and scientific use. A member of the Nehru-Gandhi family, she married Feroze Gandhi at the age of 25, in 1942. Their marriage lasted for 18 years, until Feroze died after a heart attack in 1960. They had two sons  Rajiv (b. 1944) and Sanjay (b. 1946). Her younger son Sanjay had initially been her chosen heir; but after his death in a flying accident in June 1980, Gandhi persuaded her reluctant elder son Rajiv to quit his job as a pilot and enter politics in February 1981. Rajiv took office as prime minister following his mother’s assassination in 1984; he served until December 1989. Rajiv Gandhi himself was assassinated by a suicide bomber working on behalf of LTTE on May 21, 1991. Prime Minister Indira Gandhi with grandson Rahul Gandhi on her 53rd birthday, in New Delhi on November 19, 1970. In January 2017, a woman called Priya Singh Paul claimed to be Indira’s grand-daughter as Sanjay Gandhi’s biological daughter. She claims that she was given away for adoption because Indira Gandhi hid her as a child and her mother as a wife of Sanjay Gandhi for political reasons. Gandhi had been swept up in the call for Indian independence since she was born in 1917. Thus by 1947 she was already well immersed in politics, and by 1966, when she first assumed the position of prime minister, she had held several cabinet positions in her father’s office. Her domestic initiatives did not necessarily reflect favourably on Indian women. Gandhi did not make a special effort to appoint women to cabinet positions. She did not appoint any women to full cabinet rank during her terms in office. Yet despite this, many women saw Gandhi as a symbol for feminism and an image of women’s power. After leading India to victory against Pakistan in the Bangladesh liberation war in 1971, President V. V. Giri awarded Mrs. Gandhi India’s highest civilian honour, the Bharat Ratna. In 2011, the Bangladesh Freedom Honour (Bangladesh Swadhinata Sammanona), Bangladesh’s highest civilian award, was posthumously conferred on Indira Gandhi for her outstanding contributions to Bangladesh’s Liberation War. Indira Gandhi’s main legacy was standing firm in face of American pressure to defeat Pakistan and turn East Pakistan into independent Bangladesh. She was also responsible India joining the Nuclear club of countries with Nuclear weapons. Despite India being officially part of the non-aligned movement, she gave Indian foreign policy a tilt towards the soviet block. Being at the forefront of Indian politics for decades, Indira Gandhi left a powerful but controversial legacy on Indian politics. The main legacy of her rule was destroying internal party democracy in the Congress party. Her detractors accuse her of weakening State chief ministers and thereby weakening the federal structure, weakening independence of judiciary, and turning the cabinet into a joke by vesting power in her secretariat and her sons. Indira Gandhi is also associated with fostering a culture of nepotism in Indian politics and in India’s institutions. She is also almost singularly associated with the period of Emergency rule and the dark period in Indian Democracy that it entailed. Her actions in storming the Golden temple alienated Sikhs for a very long time . She also remains the only woman ever to occupy the office of the Prime Minister of India. The two extreme points of India: the northernmost Indira Col (35.674520°N 76.845245°E) and the southernmost Indira Point (6.74678°N 93.84260°E) are also named after Indira Gandhi. The Indira Awaas Yojana, a central government low-cost housing programme for the rural poor, was named after her. The international airport at New Delhi is named Indira Gandhi International Airport in her honour. The Indira Gandhi National Open University, the largest university in the world, is also named after her. Indian National Congress established the annual Indira Gandhi Award for National Integration in 1985, given in her memory on her death anniversary. The Indira Gandhi Memorial Trust also constituted the annual Indira Gandhi Prize.